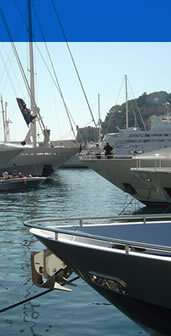 RMD Marine, Rainsford Mann Design offers a complete service in luxury super yacht design. The London-based yacht designers provide a full spectrum of services including: exterior design, interior design & naval architecture, offering our clients a ‘one-stop’ design service for innovative new-build & refurbishment super yacht projects worldwide. Each design service can be commissioned separately allowing our clients complete flexibility when discussing their projects with us. Currently on the drawing board are a stunning new 170m (558ft) megayacht, a 49m (144ft) displacement yacht and a 30m (98ft) production yacht. RMD yacht designers have also designed their own range of semi-production motoryachts allowing clients to purchase an existing hull and superstructure with the opportunity to custom design the interior. The current range includes: Zeptepi, a 46.5m (153ft) gas-turbine driven vessel; Osireion, a high performance 37.5m (123ft) luxury fly-bridge yacht powered by twin MTU engines and water jets; The Aquacraft, a 30m (98ft) & 26m (85ft) cutting-edge business day boat for Middle Eastern, Mediterranean and US markets and Zisudra, a 26m (85ft) flybridge motoryacht with 4, 6 & 8 berth interior layouts.